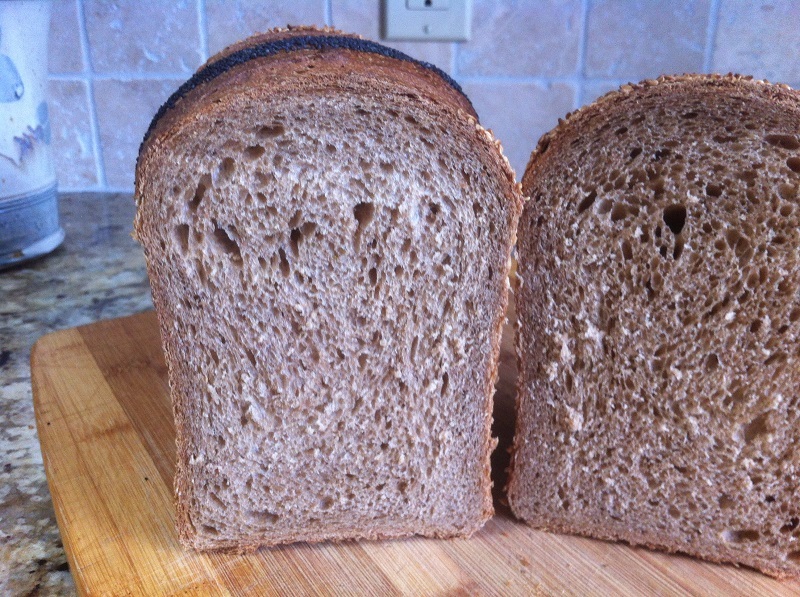 The bread I've been baking lately is one I ran across on Ross/rossnroller's latest blog back in September. The bread, a Wholemeal and Stout loaf enriched with egg and butter is one that Derek/yozza put together using his own home brewed stout and demonstrated to his students during one of his sourdough bread classes at the college where he works. When I saw the photos of Derek's loaf (above) that he'd baked off at home the next day I was sold. It looked so good to me I knew right away that I had to give it a try. Derek was kind enough to share his formula on Ross' thread and answered a few questions I had via PM as well. My thanks go out to Derek for his inspiration and good advice in the making of this fine bread. The first attempt got off to a rocky start when I was scaling out what I thought was whole grain flour for the overnight soaking in stout. After I had the flour soaking and was putting the bag away I realized I'd used whole rye flour instead of whole grain wheat flour... yikes! That's what I get for starting a mix at the end of long day and for not accepting the fact I need to wear my glasses more often than I do. 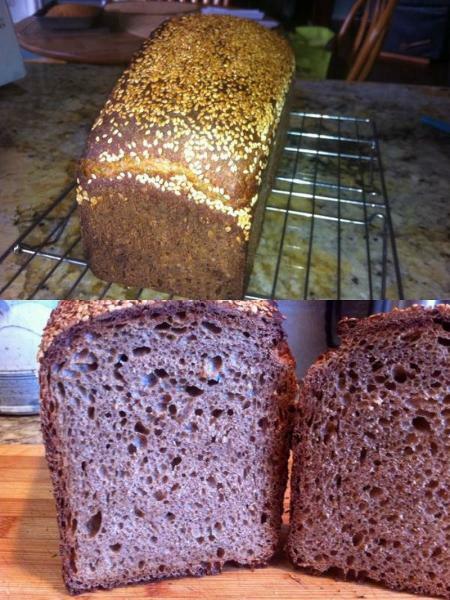 Fortunately I like rye breads, and other than the loaf not being what I'd intended, it turned out reasonably well. By the time I began the final mix 15 hours later, the levain I'd started the night before had over-ripened and I wound up having to add some commercial yeast to the mix in order to kick start it enough to get fermentation going. This turned out to be a pretty tasty mistake, all things considered, and one I'd like to try again but next time with the intention of using rye flour. The second attempt was better in terms of looks, but the flavour was lacking due to rushing the bulk fermentation. I needed a loaf for the next day and instead of giving it a long retarded BF, the dough was mixed quite warm with an increased leaven and overall hydration at 58% for a 2 hour BF at 78-80F with the final rise being approximately 3 hours. The loaf had terrific oven spring, producing quite a lofty, high profile bread, due in part to the lower than normal hydration. The soaker used for this mix was made with Cooper's bottle fermented Australian Stout and One Degree Organic Sprouted Whole Meal flour. I've wondered since if that may have had some impact on the overall leavening of the loaf, the soaker becoming a secondary levain of sorts. Overnight temperatures were in the low 70F range at that time, and I suppose it's possible but since I didn't do a float test on it I can't say with any degree of certainty. The price I paid for using this abbreviated procedure of course was flavour. Not that it tasted bad, just rather ordinary. Considering the high quality ingredients that went into the mix it's a bit of a shame, but being that I pushed things along the way I did it didn't come as total surprise. In the end I was happy the ingredients didn't go to waste and that I had a loaf of bread to see me through the coming week. For the third mix I allowed sufficient time to give the dough the long retarded fermentation that it needed to build flavour and stuck close to the Derek's original procedure but made a small addition to his formula by including 15-16% cracked wheat to the overall mix to give the loaf more body. The cracked wheat was added to the stout and soaked overnight along with the wholemeal flour. If there had been any fermentation going on in the soaker of the second mix I'm quite sure there was little, if any, this time around as overnight temperatures had cooled off considerably in the interval between mixes. Going by how long it took before the loaf could be baked off, I'd say the leaven did the job all on it's own this time. Hydration for this mix was increased to 70% and the leaven went back to 30% from the 40% of the previous loaf. Bulk fermentation was 3 hours with 3 stretch and folds at 45 minute intervals, then an undisturbed 45 minutes before rounding, resting, shaping and placing in the pan for the 24 hour retarded ferment. The final rise took over 5 hours in the B&T proofer at 78F before I thought it had a hope of doing anything worthwhile in the oven and even then it wasn't clear what I'd wind up with. When I checked the loaf after the first 10 minutes, removing the steam system at the same time, I could see it hadn't jumped as much the previous loaf, thank goodness, looking much more like the loaf that Derek had made, which was my goal from the beginning. Total bake time was 40 minutes, initially at 485F for 10 minutes, then 20 minutes at 465F and the final 10 minutes at 440F, leaving the loaf in a dead oven with the door ajar for 20 minutes. Third times the charm it seems as this turned out a very nice loaf, just rich enough from the butter and egg to give the crumb a soft and moist texture but not so much that the crumb is dense or cakey. The sour level is in the medium range, appropriate for this type of bread I feel, with the flavour of the stout coming through slightly stronger, imparting it's malty characteristics to give the overall flavour some deep and delicious notes that make it hard not have just one more slice. For my tastes this is a bread meant for cheese and with that in mind and some leftover stout I decided to make a Welsh Rarebit to have it with. Straight from the broiler and piping hot, this may be the ultimate way to enjoy the combination of stout, sharp cheddar and good homemade bread. What fantastic looking bread. I love that decoration on the top as well and the crumb looks amazing. Glad you like the top deco as it was my last minute attempt to give the loaf some kind of distinctive look. Too soft for a scoring pattern and didn't want to hide the crust under a cover of seeds or flour so this seemed like a good alternative. The crumb and flavour are the real winners for me though. have the POX, sure looks terrific as well. With the rye you need a good pate and some stinky cheese which are no problem for you Franko. The bread looks like something i want for breakfast with some smoked salmon, cream cheese and onion. What a great loaf of bread! Agreeing with Isand, what a beautiful decoration. Did you cut out a pattern to make it? The circles were made using graduated biscuit cutters placed on the dough surface after it had been brushed with cornstarch glaze, then alternately spooning poppy and sesame seeds into each one and lifting the cutters off as carefully as I could. Happy you liked the result! Very attractive loaves. My first thought was yen and yang loaves. Very eye catching with the seed art. What a lovely crust and tender and tasty crumb! Some great looking loaves to feast on with your lovely meal. The seed pattern is something I've never seen or done before so I'm happy that the responses so far, yours included, have been so positive towards it. When it comes to the nitty gritty though it's all about Derek's very good formula and procedure for me. Substance takes front row over style every time IMO, but it's nice when you can have a balance of both. Justice not only done, it can be seen to be done! It is also worth the wait , i have been expecting your post after our PM's on your trials and tribulations. I'm Impressed that you found Coopers stout from South Australia in Canada, Coopers is a great bottle fermented Stout. I decided to start home brewing stout as away of using it economically in my bread making,and im pleased to say it is working very well and a great drink to boot, i have just made a 17 litre brew that should be ready for bottling before the weekend, an Australian brew kit from Deliverence, i shall follow that one with a connosieur stout from Muntons in the UK which i have made before and was excellent. Anyway i digress great post and great bread Frank well done. My apologies for the delay but #1 was a non starter as you know, #2 I wasn't satisfied with, and #3 just took a while to get around to making and then doing the write-up for it. 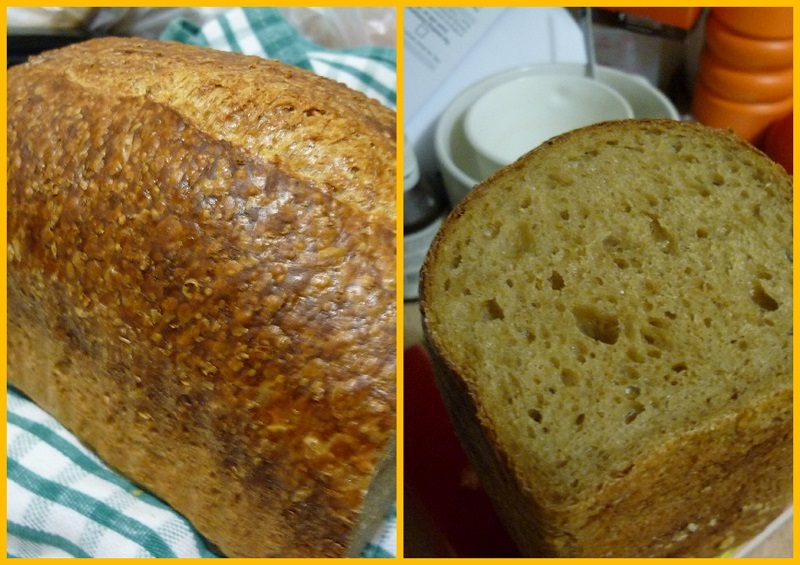 I'm glad I took my time to get the result I wanted though, this bread of yours (when properly made :^) ) is superb. 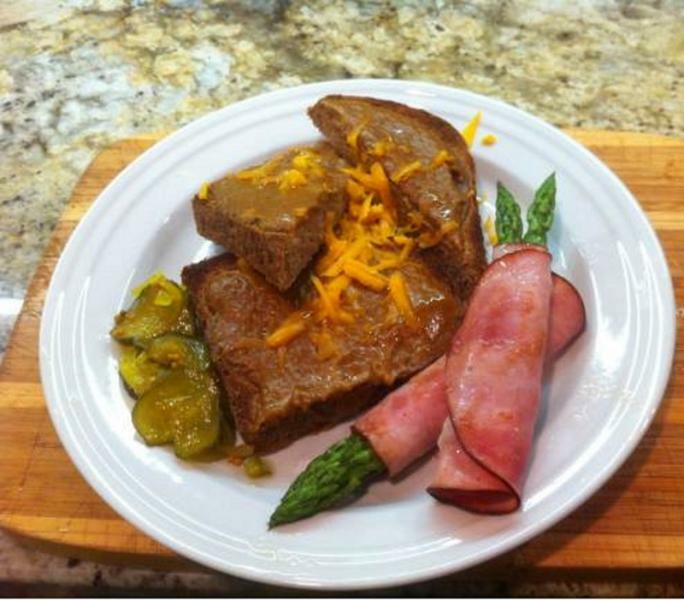 Many thanks for sharing your recipe my friend, it's a beauty! I was a little surprised as well to find Coopers in our small town, but after having a thorough look through one of our private liquor outlets I finally dug some up. It is the one and only bottle fermented brew I've seen in our local stores and I intend to use it in the near future for making a barm bread of some kind. Thanks for your kind words on the bread and post, and for your consultation when I first contacted you with questions regarding the formula. 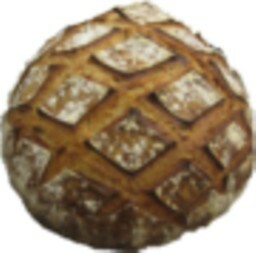 These three breads are very beautiful versions of Derek's bread. 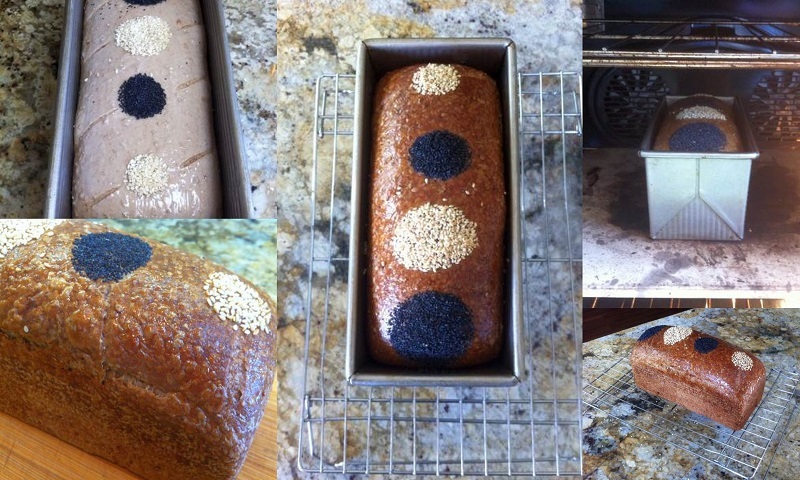 Perfectly shaped, tall loaves, lovely crumb, gorgeous decoration with the seeds and scoring! And a stout soaker too...what a great idea! Derek's idea of a stout soaker brings an incredible depth of flavour to the mix when it's given enough time and a strong leaven. It's a bit tricky for me to schedule during my work week but definitely one I'll be putting among my regular bakes when time permits. Try again, Franko. Gremlins in the system! I like the rye version best.....what a surprise you say! But all three variations have their own characteristics and look wonderful too. In the 1980s the Big Six brewers, as they came to be known, did their very best to force us all to drink from the keg. Cooper's Pale Ale sat alongside bottles of Guinness and Worthington's White Shield as a real alternative from the bottle. So I remember that variety very well, but haven't drunk the Stout. Interestingly I too have been playing around with barm of late, trying to create a viable alternate means to ferment Spelt, and create a malty, grainy type of loaf. I found that the beer yeast from the live ale gives very little overnight reaction. Several feeds of flour and water are required for it to really take off. So the resulting culture has plenty in common with a sourdough, as surely the S. Cerevisiae dies off and other yeasts come to predominate in the culture. Look forward to finding out more about how you get on. Awesome bread, great post as always. Looks great as a loaf in a pan. The rye version has potential for even greater flavour than the original version judging by the one that was made. Although it paled in comparison to loaf #3, I'm sure if the leaven hadn't pooped out on me it would have been as good, if not better than the wheat based version for flavour. Another project waiting in the wings it seems so perhaps I'd better stock up on more Cooper's Stout while it's still available. I'll keep you posted on how I make out with the barm breads. Many thanks for your always generous comments Andy! i agree that all 3 breads are winners, i think your Rye was a great result from what was potentially a disaster (loosing that stout), but you were able to not only save it but as i said before a new loaf is born. #2 well that looks wonderful too, nice and bold just screaming to be used in a sandwhich. #3 Everyone loves the application of the seed and as you say allows the beautiful colour of the crust which comes from the maltiness of the stout to shine through. I found with my loaf that it was impossible to stop at one slice. The Coopers will allow you to get a barm going as Andy said after a couple of feeds it will be away for you! i of course use the dregs in the bottom of the fermenter, there are at least 2 litres of the stuff left after drawing off the stout into bottles, it can go in the fridge for future use. An old Italian friend that used to brew great beer always used the dregs of one brew to start the next throwing away the sachet of yeast provided. Happy that you liked the different versions of your bread, #3 being the closest to your own I think. Next week I'll be at our local Ubrew shop dealing with some wine I have on the go and I'll ask the owner if he could save me some of the dregs from a batch of brew in trade for some loaves of bread. In the meantime I've started a barm using the stout and barley flour. No action yet, but hopefully in the next week it'll see some life.